This very emotional image features the bride and groom having an emotional moment at Berkeley Church. 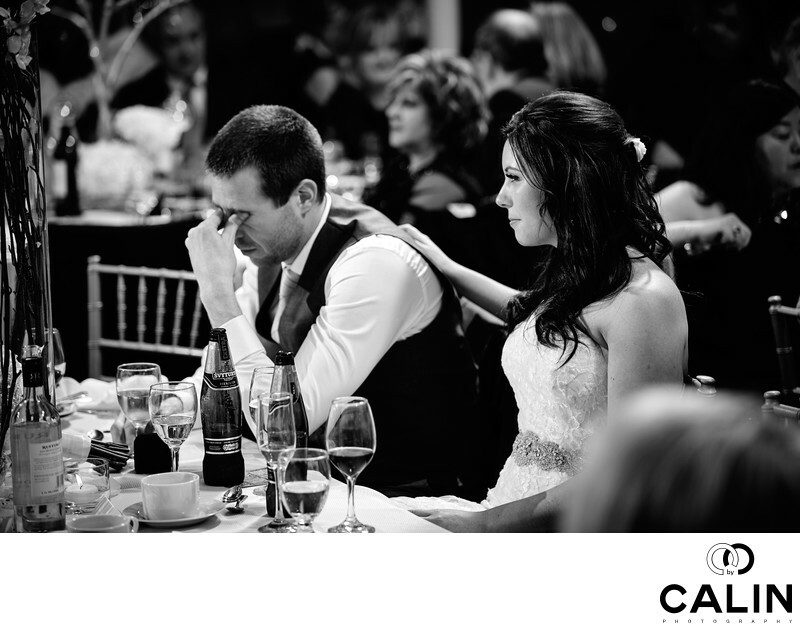 The couple is sitting at the table and the groom is wiping his tears, while his bride is placing her hand on his shoulder comforting him. The image has three layers, which gives the photograph dimension. In the foreground, the guest in the lower right part of the frame is is looking at them. The middle layer, the focus is on the bride and groom and finally, in the background we can see a pensive lady looking away. She seems completely decoupled from reality. From a composition standpoint this image was created using the rule of thirds. The bride and the groom are positioned in such way so that they divide the image into three parts. Also, I used a leering technique. There is a person in the foreground that gives the image depth. Next in the middle ground, we have the bride and groom. Finally, we see a few guests out of focus in the background. The newlyweds are clearly subject of this image because they are the biggest in the frame, in focus, and the brightest. The bride is looking at the groom and resting her arm on his back to console him. Her arm creates a leading line which, alongside her gaze draw our attention to the groom and emphasize the emotion in this photograph. In post processing I converted this image into black and white and I burnt any other subjects competing for visual attention in the shot. Despite its beautiful features, Berkeley Church is often a Toronto wedding photographer's nightmare. The light coming through the stained windows is coloured which makes white balance correction a challenge. Also, the tall ceilings do not allow a photographer to bounce light. Lighting was definitely a challenge at this wedding venue. As such, I used four strobe lights defused through 7 feet translucent umbrellas to create this beautiful soft light that is so flattering for the subjects' skin. Like in many other photos where emotion is involved or transmitted if you want, I used a black and white processing. After giving it a lot of thought, I felt there was something missing so I added some grain in post production. Thus, the image has that film look characteristic of old images taken a few decades ago.